Midnight Apothecary, the rooftop cocktail bar in Rotherhithe, is back for the summer of 2017, opening every Friday and Saturday evening. Run by 'Cocktal Gardener' Lottie Muir, it's one of the original pop-ups, dating back to 2011, and takes place on the roof of the old Thames tunnel at The Brunel Museum. Note that tickets need to be bought in advance (£5) - full links and info below. "Campfire cocktails in the city are back! Midnight Apothecary, the legendary botanical cocktail bar situated above Brunel’s underground Grand Entrance Hall in Rotherhithe, is officially opening for the Summer Season on Friday 5 May. This year for the first time, Midnight Apothecary is launching a special Happy Hour offer on Fridays. Buy two botanical handmade cocktails and get the second half price, until 7pm. Imbibe Midnight Apothecary’s exquisite seasonal foraged and garden cocktails such as the Woodland Martini, Lilac Days, the Cherry Blossom and the Chelsea Fringe Collins. All cocktails are infused and garnished with plants grown in the Brunel Museum’s rooftop garden or foraged nearby by founder Lottie Muir AKA The Cocktail Gardener. The menu changes regularly according to what’s in season. Top quality spirits and beer are sourced locally where possible including Jensen’s gin and Hiver honey beer, both from Bermondsey. 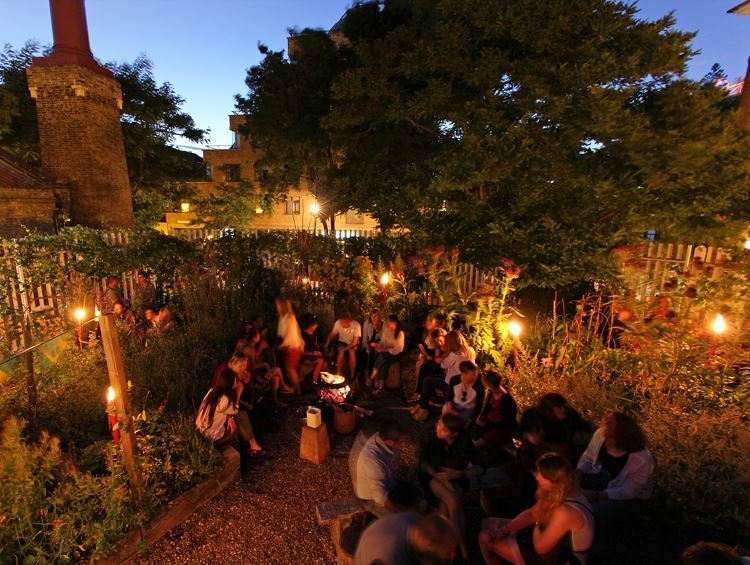 Relax around the campfire, toast some marshmallows and watch the sun set over the Thames. Enjoy some culture with your cocktails and explore one of London’s truly hidden gems. Join a complimentary free guided tour into Brunel’s huge underground Grand Entrance Hall beneath the roof garden and uncover the history of the first underwater tunnel in the world. Satisfy your tastebuds with Greek BBQ from Pan chef extraordinaire Despina Siahuli - ex E5 Bakehouse and French & Grace. Now in its sixth year, Midnight Apothecary has been voted one of London’s best pop-up rooftop cocktail bars since 2012 and has featured in Vogue, Time Out London, ELLE UK, The Independent on Sunday and World’s Best Bars. Founder Lottie Muir AKA The Cocktail Gardener won the Fortnum & Mason Food & Drink Awards 2016 Debut Drink Book of the Year with ‘Wild Cocktails from the Midnight Apothecary’. Midnight Apothecary is open every Friday and Saturday from 5 May 2017 through to the end of September. Doors open 5.30pm, last orders 10pm. Tickets are £5 and need to be pre-booked online."